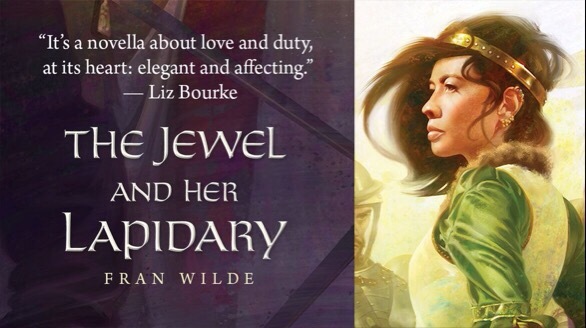 The little novella that could – The Jewel and Her Lapidary – part of my gemworld stories – hits readers and bookstands today. If you pre-ordered (thank you! ), it’s arriving soon, and if you’re looking for it, it’s out Now! Artist Tommy Arnold posted at Tor.com yesterday about the steps involved in making cover art for Jewel. It’s an amazing reveal of the layers beneath his process. On May 4, author Michael Swanwick and I will visit Main Point Books in Bryn Mawr PA to celebrate the launch – shenanigans start at 7pm! Hope to see you there! Beneath Ceaseless Skies has a new introduction to the audio vault version of The Topaz Marquis (another story in the gemworld) coming soon – a message from me, about all sorts of things including some background on the gemworld. … And in two weeks, I’ll be at the Nebulas in Chicago, and will have some copies of Jewel to sign at SFWA’s mass signing event on Friday night! If you’re catching up, I spoke with Geekadelphia, Geek Ireland, and dished some Jewel secrets over the past few weeks. Paul Weimer and Publishers Weekly have great looks at the book, and The Three Hoarsemen invoked Jewel while talking CJ Cherryh last week (that’s really great company and I’m honored). Hope you enjoy the novella, and this gateway to the gemworld!